Immunogen: E. coli thioredoxin (trxA). Specificity: Recognizes trx and trx-tag-f thioredoxin. Scientific Background: Thioredoxins act as antioxidants by reducing the proteins by cysteine thiol-disulfide exchange. 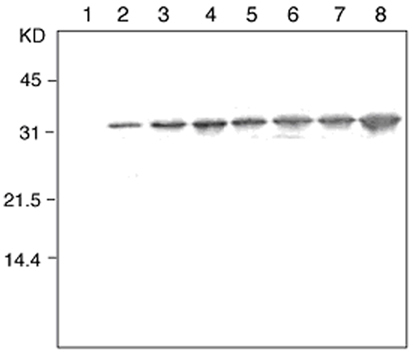 Several plasmid expression vectors have been constructed that direct the synthesis of foreign polypeptides in E. coli as fusions with C-terminal Thioredoxin (TrxA) to offer soluble expression of normally insoluble or difficult to express proteins such as cytokines and growth factors.